Hi dear followers, hope all is well in your world. Glad to see that finally, the leaves on my cherry tree are beginning to turn colour and give in to gravity. The temperatures are beginning to drop rapidly now with frost being reported from friends up north. Temperatures have affected me too as most of the last week I've had the dreaded lurgy, so haven't been out much. But still, I have good news to report. One evening in the summer, I was off to do a bat survey at Dunwich Heath in Suffolk. It was late in the day and the sun was beginning to set as I zipped along in my car down a country lane I saw a barn owl (Tyto alba) fly across the road in front of me. I've always been fascinated by these creatures and even raised one from a chick (Tyto was her name) in my younger days and used to take her out flying lots. As I approached the section of road I had just seen this bird fly across, there was a small lay-by which I promptly pulled into, after all, I was running early for the survey. Pulling into the lay-by, I could see the owl quartering the field next to the road. It was a lovely evening and like I say, I had a bit of time on my hands, so I got out of the car just to stand and watch. Barn owls really do fly silently due to a row of comb like bristles on the leading edge of the primary wing feather. They also make flying look incredibly easy as they fly so slowly and stop to hover over an area looking for a meal. Everything about an owl suggests that it's not built for speed. The flat disc shaped face is far from being aerodynamic, yet it serves another important purpose. The face is just like a satellite dish and it directs any sound direct to the birds ears, which are asymetrical (one higher than the other) to allow the bird to triangulate exactly where a sound is coming from. I watched the owl fly around the far bottom off the field then slowly make its way up and then it reached the far end of the field next to the road and I expected for it to fly back over the road, but no. It turned and flew along the field back towards me. From my keeping of Tyto, I knew from experience how an owl sees things, believe it or not, that don't have great eyesight. Their hunting skills predominantly rely on sound. So I ducked down in front of the car so my outline could't be seen protruding from around the outline of the car. I then realised, my phone was still in my pocket instead of being left in the car, so I whipped it out ready to take a photo. But then the bird turned back into the field then turned again going back the way it came. Drat! I thought, a missed opportunity as the bird flew away from me. But then it turned again flying towards me on the same path and as I got ready I really couldn't believe it as the bird flew right past me and I managed to grab this shot with my phone. I cannot tell you how extremely pleased I was with this shot, so much so, that I entered it into Suffolk Wildlife Trust's Photo Competition in the category of 'Mobile Device Photo'. The closing date for entries was on Sunday Nov 3rd and on Thursday I got an email to say I had won that category! Amazing! That chance encounter I had with a very special bird just got even better. So what did I win, I hear you ask. Er, sorry, I can't remember what the prizes were, but I was asked for my home address so that my prize could be sent to me, I should imagine it might be delivered by armoured van and security people, as I doubt a cheque of a couple of million pound would be sent in the post (always hoping). This good news helped lift me out of the doldrums of man-flu so much so, that I decided to have a little walk around my local patch to see what I could find. It had been a nice morning/early afternoon so I was hopeful to find something of interest. Perhaps a recently deceased minotaur beetle that I could preserve in my pinned insect collection, or a late bumblebee queen looking for a place to hibernate for next years project. It seemed quite busy when I got there, as most of the parking spaces were taken, but I managed to squeeze onto a little bit at the end. Then I bumped into a couple of friends just coming off the heath. All was looking lovely, however, the weather was on the turn and I knew I wasn't going to be here long. I concentrated my efforts on the bare patch of soil where I had been working last time removing the invasive brambles. I know this area is well populated with Minotaur beetles (Typhaeus typhoeus) and was apparently still quite active as I could see many fresh piles of sand removed in order to dig their deep burrows. I did find the remains of some ground beetles, in some fresh Hedgehog (Erinaceus europaeus) droppings scattered around the area, which was another sign that the beetles are still active. I walked on to the archaeology pit where Matt had been working the week previously strumming down the gorse bushes. I wanted to see if there was anything about there of interest. As soon as I got into the pit I did find what I thought was a freshly dead Minotaur beetle. I say I thought, it wasn't till I got it home to put it on the setting board that I realised its head was missing. Drat, must remember to use my glasses more often. I wandered up out of the pit with the odd drop of rain now beginning to fall and the clouds getting darker when something fluttered past me. At first, I thought it was a damselfly, but dismissed this thought as quickly as it came as it's quite late for damselflies now. I spun around to get another look to see it shoot out of sight behind a tree and my second thought was small dragonfly, but again I dashed the thought as it was too small body wise. At this point I was already extending the handle of my insect net ready for the capture when all of a sudden it came up behind me after circling the tree. 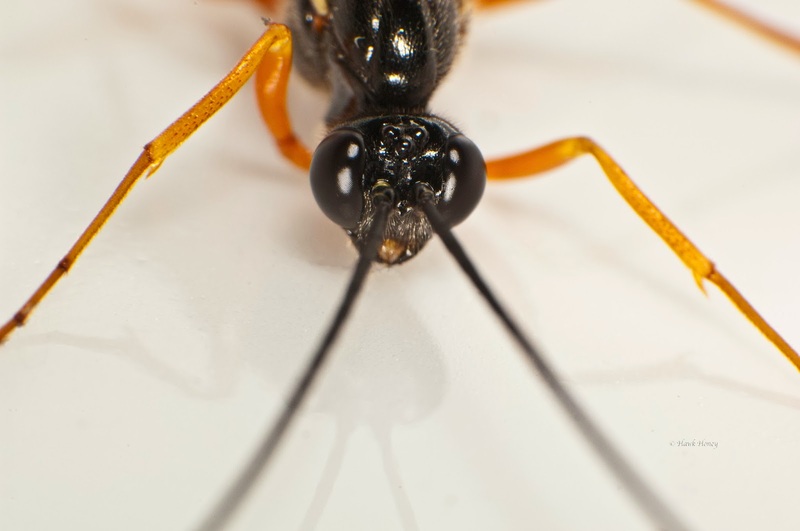 Then I knew exactly what it was, an Ichneumon wasp. I waited till it settled on the leaf of the oak tree it had been circling and then quickly swished my net over it. Looking into the net I could see I had caught it and I potted it straight away in the hope of getting a proper ID on it later. The rain drops were getting bigger by now and began to make a hasty retreat to my car to go home and identify my catch. It was quite obvious the ichneumon was best pleased at being caught, so I placed it in the fridge to cool down and after a few hours pulled her back out again to get some shots and an identification. Now when I say ichneumon, this wasn't just any old ichneumon, this one was a big one at around 6cm long with an impressive tail that was just over 3cm long. It was awesome. My what a big tail you have! 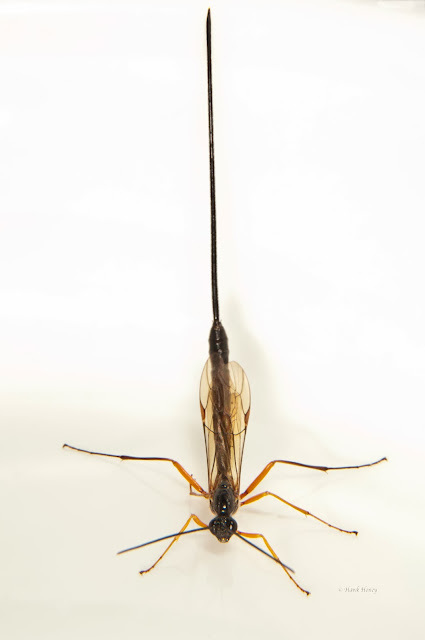 I say tail, but of course, this isn't exactly a tail, it's an ovipositor. This is the end that lays the eggs in the bark or leaves of the tree. This happens when the female, pictured above, senses the larval form of another insect munching away in the wood. The ichneumon will then insert its ovipositor into the wood to lay an egg close to the unsuspecting grub. Then when the egg hatches, the newly emerged larval ichneumon has another grub to feed on close by. I know this sounds a bit gruesome, but this is another reason why insects lay so many eggs, so that even when there are predators like this about, still some will have a chance of making it through to adulthood. The top view clearly showing the ocelli on top of the head. I posted these pictures on to some internet forums, social media, etc looking for help with the identity of this wonderful creature and was informed that the only real way of getting a true positive ID was to use a microscope to see the tip of the ovipositor, which was not going to be easy to do with a live specimen. Now, as most of you know, I'm really not into killing things. I recently submitted my moth list of all the moths I caught this year to my County Moth Recorder, who informed me that he wouldn't be able to accept some ID's because they could only be positively identified by cutting open their genitalia. My thoughts on this are exactly the same for the ichneumon and any other creature I happen to come across, I don't need to know the name of it that badly, that I need to kill it. 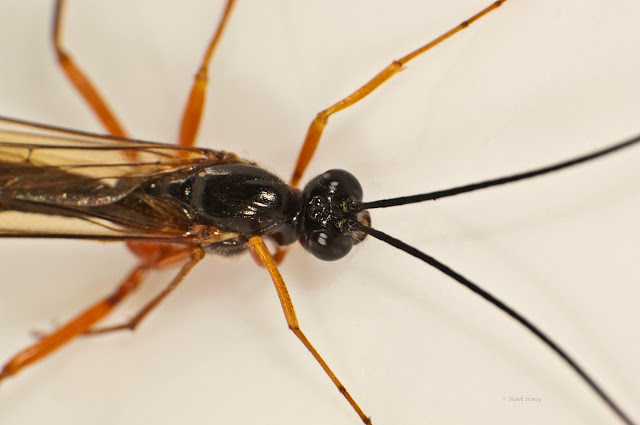 That said, one fellow who seemed to know his ichies (not an official term) had come to the conclusion that it was most likely going to be Dolichomitus mesocentrus, a common large ichneumon found in the southern half of England. Looking at other pictures of this species, it looks pretty spot on to say the least and I'm more than happy with the ID and this beautiful creature was let go to fly away to do what nature intended it to do. Look up to the skies! This is a plea from me to you to ask for any sightings you've had of any starling murmurations in or around the Ipswich area. I saw a small one earlier this year over east Ipswich near Ransomes Industrial Estate. Caught on my mobile earlier this year. However, this murmuration hasn't returned this year and I would like to get some decent shots of one. So if you know of a murmuration near you, please let me know either by leaving a comment below (don't worry, no-one will see any of your contact details) or via Twitter @SuffolkNature. Me and the wifey went out shopping this afternoon and the first thing I noticed was this lovely looking creature. So wherever you are, whatever you're doing, always keep an eye out for wildlife, it's always there and sometimes as above, in the unlikeliest of places. Till next time dear followers, keep safe.